Friday: Warm, breezy. Highs near 90. Friday night: Warm, lows in the 60s. Saturday: Building clouds, more humid. Late storm. Highs in the 80s. Sunday: Mostly cloudy, light showers. Highs in the 50s and 60s. Memorial Day: Mostly cloudy, spot shower. Highs in the 60s. High pressure south of New England brings warmer weather today and tomorrow. It is a warm breeze today with temperatures pushing 90 degrees in most locations with wind gusting past 30 mph from the west. Humidity levels are moderate but will climb tonight and tomorrow. Clouds start to fill in a northern New England tonight with a chance of a thunderstorm, as another front from Canada makes its way southward. That front slowly eases southward tomorrow with a few showers and storms north. Highs in western and southern New England again will be close to 90 degrees. The threat of thunderstorms increases toward sunset especially from Vermont into New Hampshire and southern Maine. Showers and thunderstorms are likely across much of New England, except drying in Maine, tomorrow night. There will be a completely opposite wind direction Sunday, from the east 10 to 20 mph where the ocean water temperatures are in the 50s, that means much cooler and a rather gray Sunday. 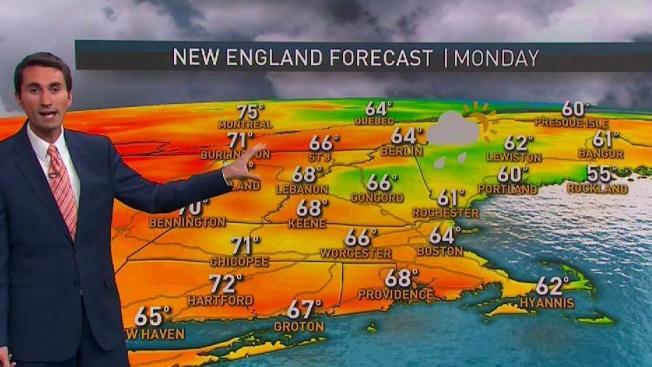 Still a few showers or thunderstorms are possible with a high temperature close to 70 degrees in western New England, and perhaps near 70 in Maine if the sun comes out. Memorial Day Monday is still somewhat of a forecast challenge, if we can get enough sunshine the temperature may get back to 70 degrees or better, but there's a chance that the clouds will linger with a few showers so we will keep temperatures in the 60s for now but hope for an improved forecast as the weekend goes along.